Notes: I’m working on a future piece on sour beers, which is a style that is less familiar to me than many others. So for the sake of research I decided I better update my knowledge of sour beers by drinking a few. 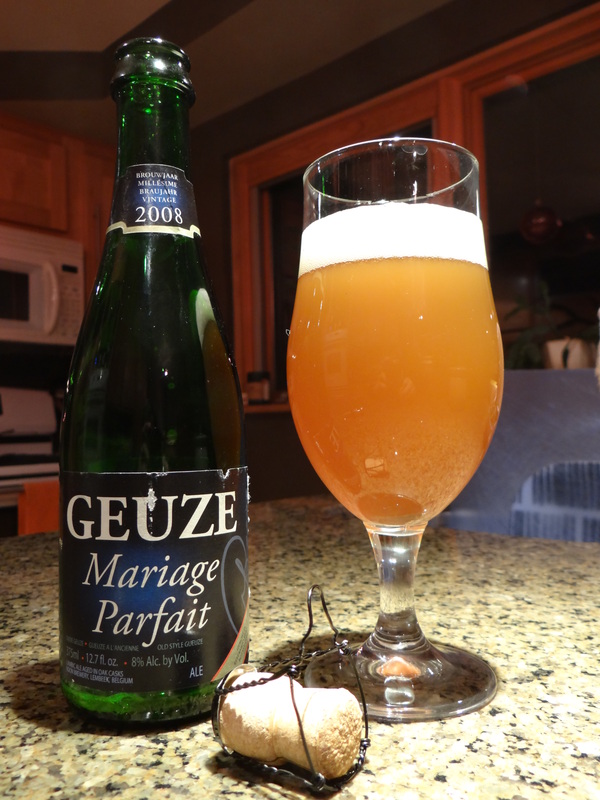 Tonight I’m reviewing a Geuze, Marriage Parfait by the Boon Brewery in Belgium. Geuzes are made by blending young and old lambics and then aging for 2-3 years. The label on the bottle says “Traditional Belgian Oude Geuze. 100% spontaneously fermented lambic aged for a minimum of three years in oak Refermented in the bottle. Tart, dry, exceedingly complex aroma.” This beer has a 8% ABV which is pretty high for Geuze, 4-6% is the typical range. The first thing that I find interesting is the time scale for making and enjoying this beer. As you can clearly see in the neck label in the picture above this is a 2008 vintage, meaning it was originally made in 2008 and then aged until 2011 when it was released for sale. On the back there is another date. It says enjoy before July 27, 2031! That’s right the beer is brewed to stay fresh for up to 20 years. What a huge contrast compared to the American IPAs that we were talking about in the Blind Taste Test Challenge a few weeks ago. It would be interesting to see what age does to this beer, but I don’t have the patience to wait even until tomorrow. I love the look of this beer—hazy, translucent golden-orange color. It does look vaguely like a dessert, as its name would suggest. It pours with a pretty impressive 3 fingers white head, the high level of carbonation from the bottle conditioning sends up bubbles that quickly carve out bubble shaped holes in the head, until it resembles Swiss cheese. After a few minutes the head recedes to a thin layer, leaving behind relatively little lacing on the walls of the tulip glass. The aroma is tart and fruity, I perceive lemon as the dominant fruit in the nose. The taste is tart and acidic as you would expect for a sour beer, but the sour is not overpowering. The lemony citrus fruit notes are complimented nicely by the crispness of the lactic acid. The finish is light and mildly effervescent, with a champagne-like mouthfeel. This is a pretty approachable sour beer. The acids keep it tart and crisp, but not to point where you have to pucker on every drink. If you’re unfamiliar with sour beers they will change the way you see beer. If you like tart lemonade and champagne this is a beer you should try. How do I pick good beer at the store?